Is Home the club to save London nightlife? Paul Oakenfold thinks so. He wants to make his residency the most important club night. And if anyone can do it. 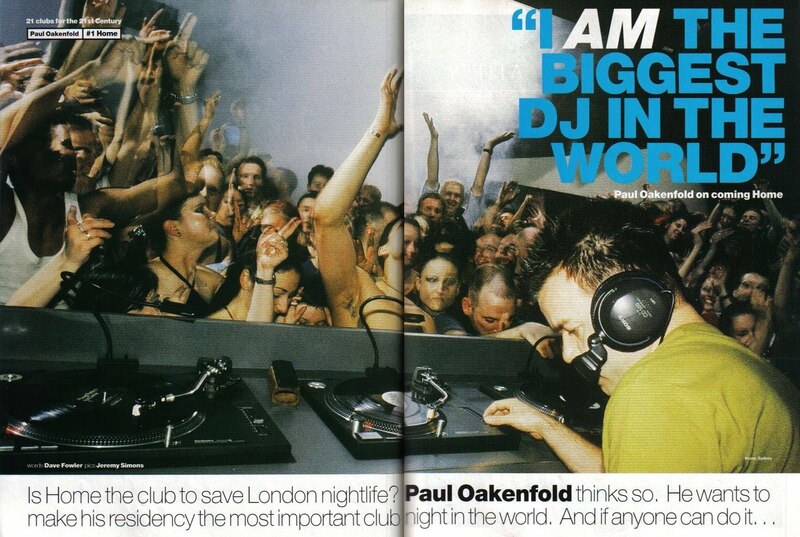 . .
EVERY football team needs a Michael Owen and every nightclub needs a Paul Oakenfold. Home in London, the global superclub for the next millennium, has just made Oakenfold its resident, in one move ensuring both critical and commercial success. DJs don’t come any bigger, any better or any more focused than Paul Oakenfold. He is the past, present and future of house music. The Don. And the reason we’ve flown to the first Home, in Sydney, Australia, for the weekend. Pretty arrogant, eh? But in fact it’s taken over four hours of constant cajoling, probing and harassment to push the world’s greatest DJ to admit to his status. Even now he’s worried what ‘the people’ might think, even though those same people have voted him Number One themselves. This is the Oakenfold paradox, the web of contradictions underpinning an ultra-successful personality obsessed with the public perception of being ‘normal’. Oakenfold, it seems, is the permanently “embarrassed” over-achiever. The star more at home with kids on the Sydney harbor ferry than the industry he helped create. The man who lunches at fashionable eateries like The Caprice, but sinks pints with the same tight circle of friends he has had for 20 years, “even though some of them have got a little bit jealous.” The native Londoner who deserted the capital for a residency in Liverpool. The interviewee who half answers one question, then answers half a dozen more at once. The self-professed wine lover who bizarrely names pink champagne as his favourite tipple. The man who with his Perfecto label created and evangelized the melodic trance sound, then abandoned it just when it became the dominant musical force in Europe. The dyslexic with a fear of a twisted word, but a lust for knowledge through travel. To paraphrase Winston Churchill’s famous remark on Russia, Oakenfold is little short of a riddle inside a mystery inside an enigma. 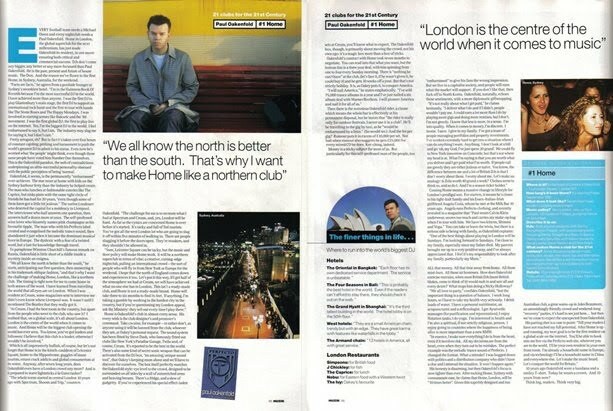 “We all know the north is better than the south,” he starts, anticipating our first question, then answering it in his trademark oblique fashion, “and that’s why I want the challenge of making Home, London, like a northern club. The timing is right now for me to come home in both senses of the word. I have learned from travelling the world that all eyes are on London. When I was resident at Cream, some magazines sent to interview me didn’t even know where Liverpool was. It wasn’t until I mentioned The Beatles that they really got it. Which is all impressively bullish, of course, but let’s not forget that Home is in the kitsh-cauldron of Leicester Square, home to the Hippodrome, gaggles of inane tourists, errant crack addicts and global consumerism at its worst. 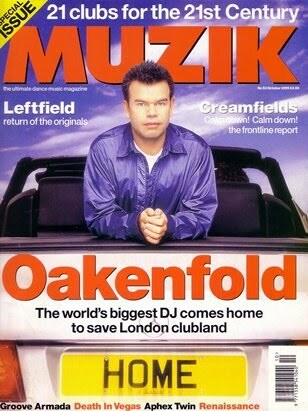 Anyway, after seven long years, does Oakenfold even have a London crowd any more? And is it prepared to wave lightsticks à la Gatecrasher? “The whole scene started in central London 10 years ago with Spectrum, Shoom and Trip,” counters Oakenfold. “The challenge for me is to recreate what I had at Spectrum and Cream, and, yes, London will be hard. As far as the cynics are concerned Home is over before it’s started. It’s tacky and full of Ted tourists. You’ve got all the west London lot who are going to slag it off within five minutes of walking in. There are people slagging it before the doors open. They’re wankers, and they shouldn’t be allowed in. Home is Oakenfold’s club in almost every sense. His every wish is the club designer’s and promoter’s command. Take cocaine, for example – or rather don’t, as anyone using it will be banned from the club, whoever they are, at Oakey’s personal request. The sound system has been fitted by Steve Dash, who famously fitted out clubs like New York’s Paradise Garage, Twilo and, of course, Cream. It’s reported to be the best in the world. There’s also some kind of secret sonic weapon that can be activated from the DJ box, “an amazing unique sound tool”, that Oakey’s keeping mum about and we’ll have to discover for ourselves. The box itself perfectly matches the Oakenfold style: eye level to the crowd, designed to be surrounded on all sides by a wall of outstretched arms and heaving breasts. There’s a fridge, and a slew of gadgetry. If you’ve experienced his special effect-laden sets at Cream, you’ll know what to expect. The Oakenfold box, though, is primarily about moving the crowd, not his own ego: it’s a magic box more than a box of tricks. Oakenfold’s contract with Home took seven months to negotiate. You can read into that what you want, but the bottom line is a three year deal, with him spinning from one to four every Sunday morning. There is “nothing he can’t have” at the club, (let’s face it, if he wasn’t given it, he could buy it) and he gets 10 weeks off a year. But that’s not strictly holiday. It is, as Oakey puts it, to conquer America. Then there is the notorious Oakenfold rider, a clause which means the whole bar is effectively at his permanent disposal, but he insists that “the rider is really only for outdoor festivals, I never use it in a club”. He’ll be travelling to the gig by taxi, as he “would be embarrassed by a limo.” (So would we.) And the fee per gig? Rumour puts it in excess of £10,000 per set. Not bad when rumour also suggests he gets £25,000 for every mixed CD he does. Ker-ching, indeed. Money is a sticky subject for most of us. But particularly for this self-professed man of the people, too “embarrassed” to give his fans the wrong impression. But we live in a capitalist society, and people will earn what the market will support. If you don’t like that, then fu*k off to North Korea. Oakenfold, naturally, echoes these sentiments, with a more diplomatic giftwrapping. ALL that money. All that time away from home. All those mini-bars. All those air hostesses. 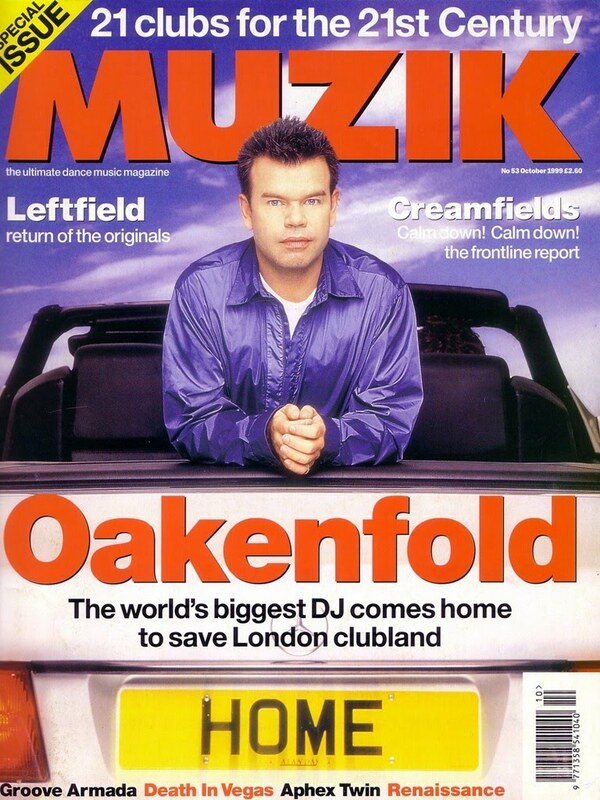 How does Oakenfold exercise restraint, when most British DJs (most British blokes, come to think of it) would rush in and sate all and every desire? What stops him doing a Nicky Holloway? “We all love to party,” confides Oakenfold, “but the important thing is a question of balance. I work long hours, so I have to take my health very seriously. I drink loads of water. I have a personal nutritionist, an acupuncturist and a reflexologist. I get Ayurvedic messages (for purification and rejuvenation); I enjoy flotation tanks, I do yoga. I’m interested in health and I’m also a spiritual, if not strictly religious, person. I enjoy going to countries where the happiness of being alive is more important than a new BMW. His honesty is disarming, but then Oakenfold’s focus is now tighter than ever. After rocking Home, Sydney with consummate ease, he claims that Home, London, will be “10 times better”. Given this superbly designed and run Australian club, a great warm-up in Jules Beaumont, an astonishingly friendly crowd and weekend-long “recovery” parties, it’s hard to see just how. . . but then we’ve come to expect the unexpected from Oakenfold. 10 years ago Oakenfold wore a bandana and a smiley T-shirt. Today he wears a crown. And 10 years from now? Think big, readers. Think very big. The finer things in life. . .